It was bound to happen. Thankfully it didn’t happen when I shot this. Tourists paid this guy to throw live chickens to the crocs. It’s real gruesome gladiator stuff. Everyone cheers on the helpless chicken. I wonder what the tourists did when a croc whipped his legs out from beneath him and then ate him. Wanna win a Fair Trade T-shirt? What do you think or Rule29‘s redesign of my site? Do yourself a favor and reload until you see the banana costumes. 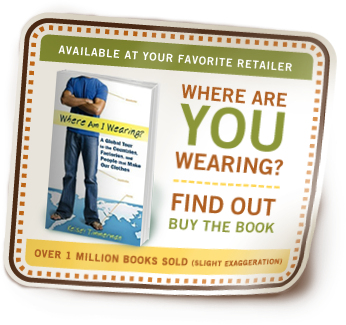 To celebrate, I’m giving away a Fair Trade T-shirt and an autographed copy of the 2nd edition of Where Am I Wearing? Just leave a comment, serious or otherwise, about what you’d like me to blog about and I’ll randomly select a commenter as the winner…. Tomorrow (September 11th) I’m speaking at Lindenwood University at 7PM in the Spellman Center’s Anheuser Busch Leadership Room. Given the name of the room, I think there might be (should be) free beer. There’s only one way you’ll find out…be there! Of course, this begs the question: Does a drunk audience mean an audience that laughs at my jokes more or heckles me more. Either way, you should be there. All the dirty details are here.